Two articles on food appeared in New York Times in one day. One was about food laced with marijuana, and the other was about serving pre-cooked food in French restaurants. They remind me of our experience with food in Spain and France. The first article describes the legalization of marijuana in some US states and how marijuana tinged food are unintentionally becoming available to children. 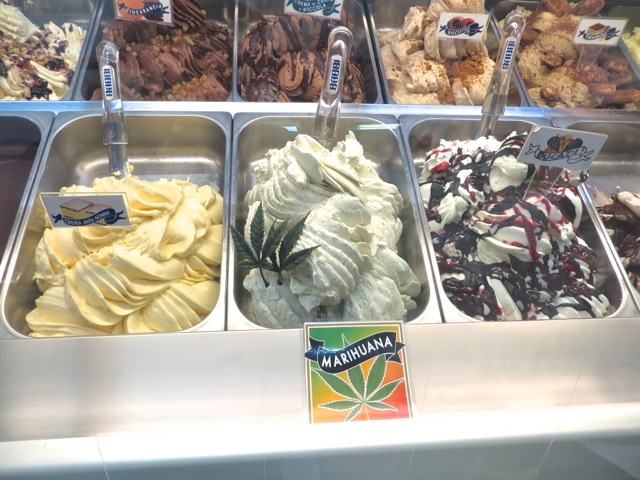 During our trip through Spain, Sally and I noticed a store selling marijuana gelato. We did not buy it and don’t know what it tasted like nor what effect it would have on us. While Spain allows cultivation of pot, it is illegal to sell marijuana. This store was either violating the law or selling fake pot. Europe is a very diverse land of many different peoples. 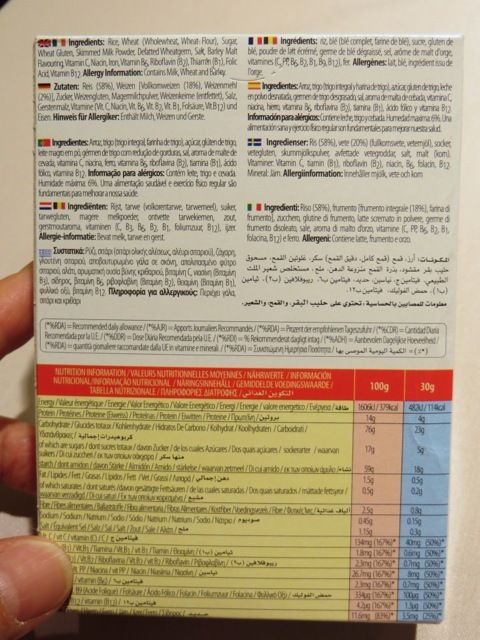 This cereal was marketed to the continent and its box carried ten languages. No wonder many Europeans speak a few languages. 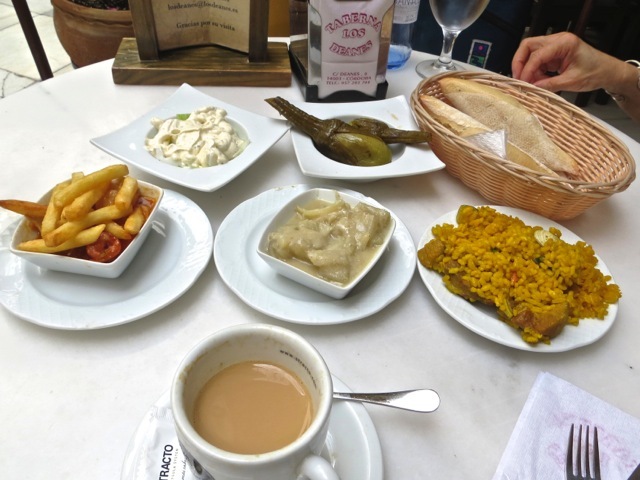 In Spain, we found mostly Spanish restaurants. But there were a few non-Spanish eateries. 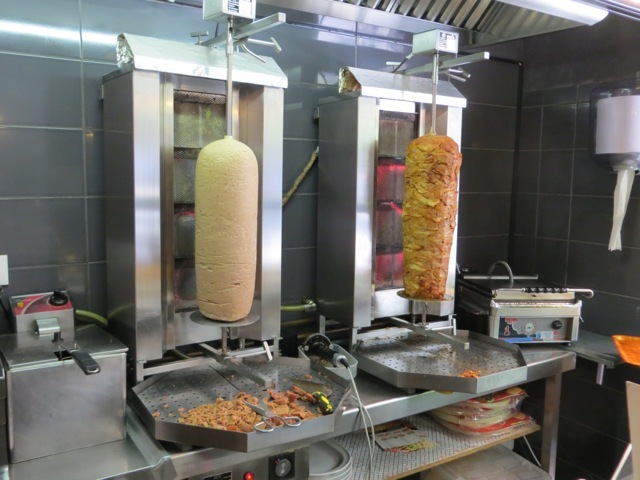 This Turkish restaurant had two shawarma rotisseries, displaying raw and cooked meat. 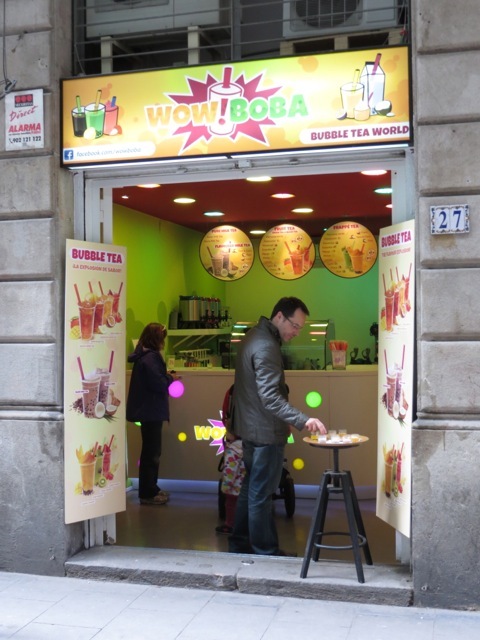 I found this Asian bubble tea fountain in a Spanish city. 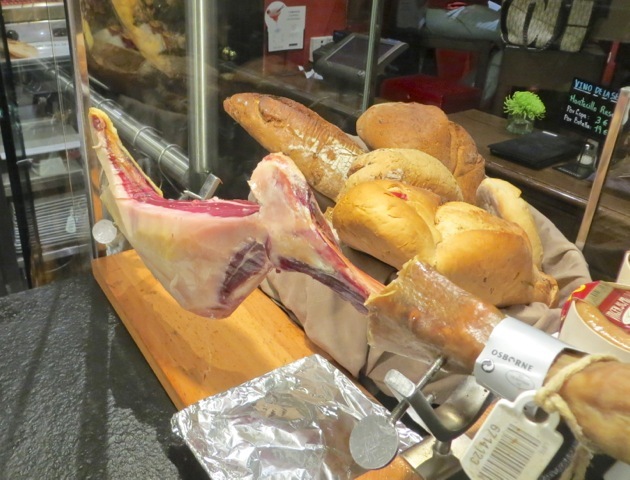 Spanish people are very proud of their jamon serrano ham. A steel contraption locked the whole ham to facilitate steady slicing into paper thin servings. 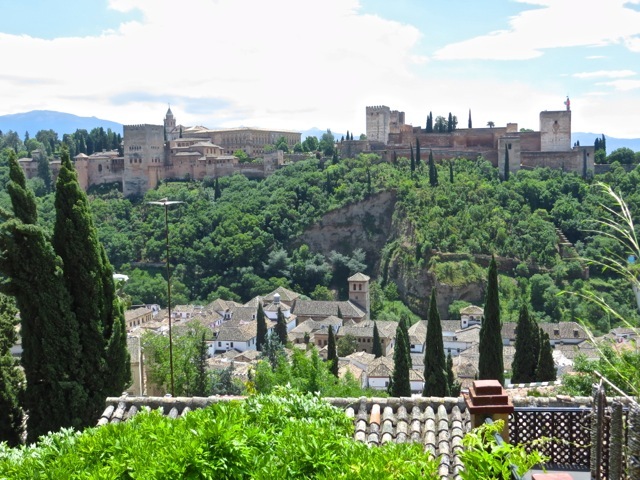 While visiting Granada, we ate in a restaurant viewing the Alhambra palace overlooking a village. The weather was perfect with a slight breeze. The view alone was worth the cost of the lunch. 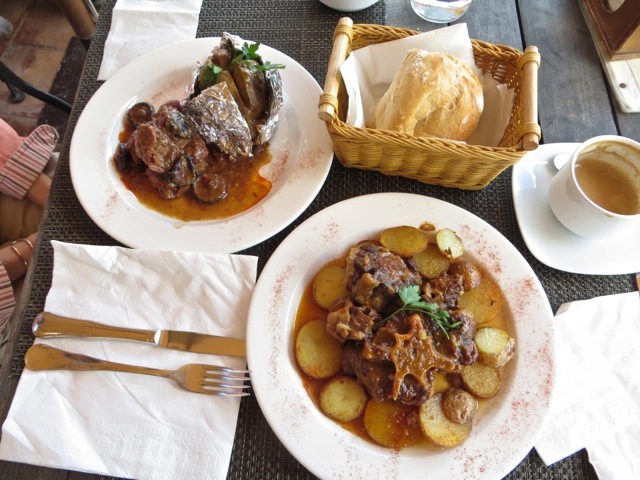 Our lunch was stewed pork and oxtail. They were delicious. We wanted to eat tapas, the iconic Spanish food. Many restaurants prepared open sandwiches called montados, a form of tapas. But to us, they were too bland. We opted for more exotic foods. This restaurant had prepared food ready to be heated and served. 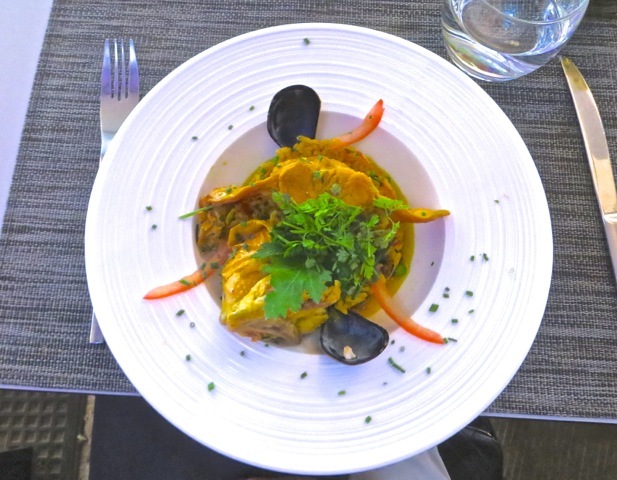 As regular orders, one dish would suffice as a meal. 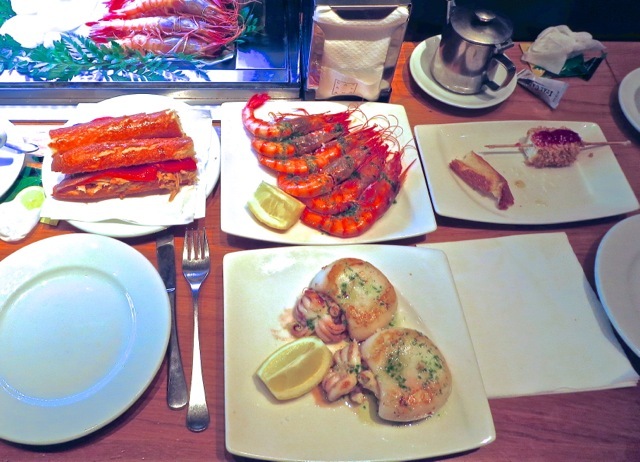 But ordered as half-dishes, they become tapas. 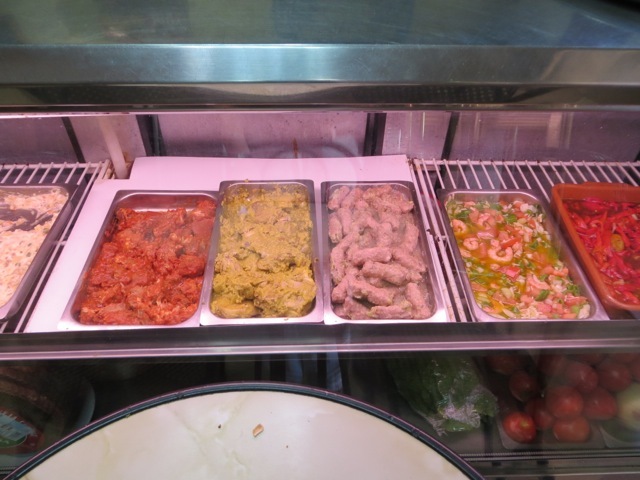 This selection of tapas included egg plants, a salad, calamares, paella, and tripe. We were disappointed with the paella, finding the rice undercooked. 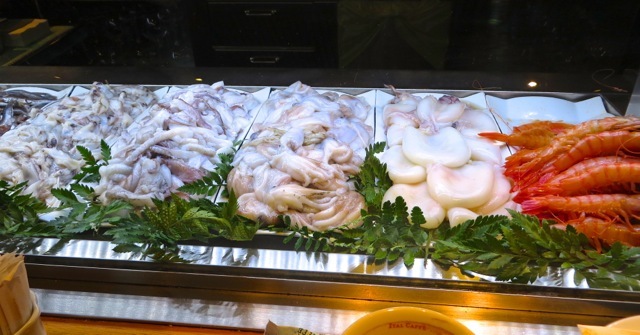 We had better calamares in most Italian restaurants. But the tripe was excellent. It was nicely spiced, tender, and free of the characteristic unpleasant flavor of organ meats. 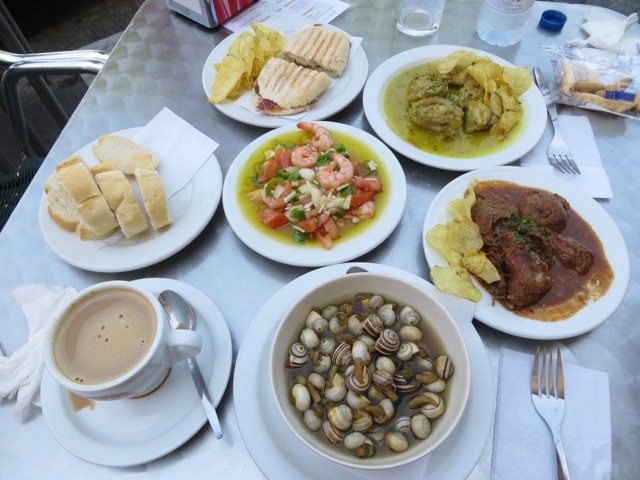 In another restaurant, our selection of tapas included a sausage sandwich, a cold shrimp dish, curry chicken, stewed pork, and boiled sea snails. The curry was good, the stew was delicious, but the shrimp was bland and disappointing. Sally and I spent much time picking meat out of the tiny sea snails. Unlike the well-condimented periwinkle snails in black bean sauce we would eat in Chinese restaurants, we found this Spanish snail to be flavorless in meat and in preparation. We abandoned half the bowl to be unworthy of our effort. 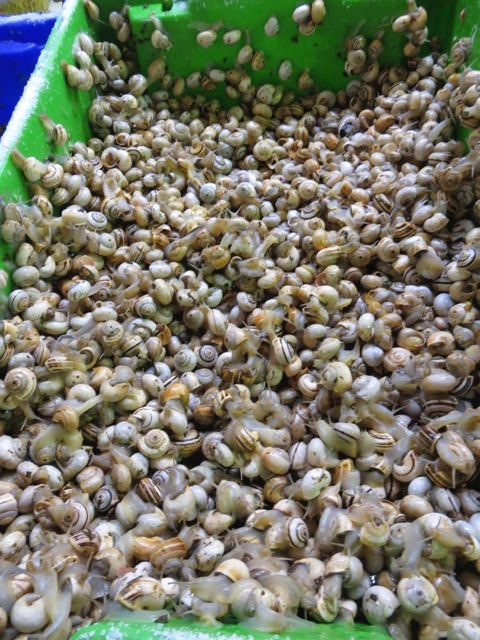 We found these live snails being sold in a market. 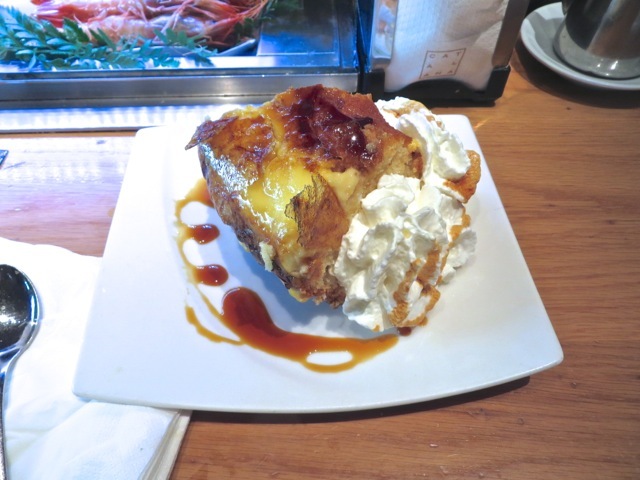 Having been disappointed by some tapas, we wanted to wrap up our tapas tour with a good memory. 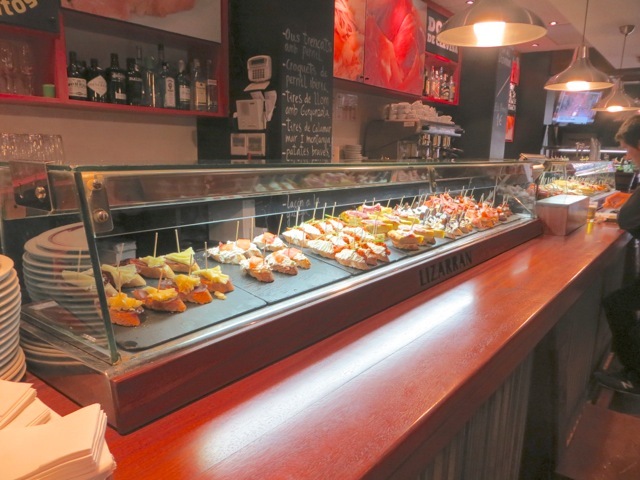 In Barcelona, we bellied up to a counter with fresh seafood displayed behind the glass. 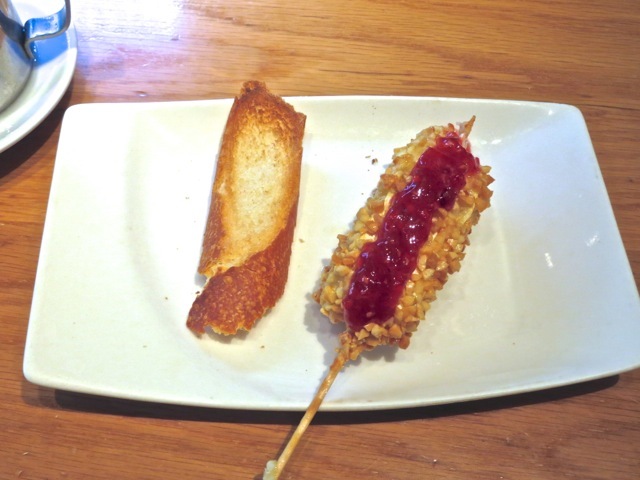 We started with a fried banana and cheese stick. We were delighted by its nice texture and taste. 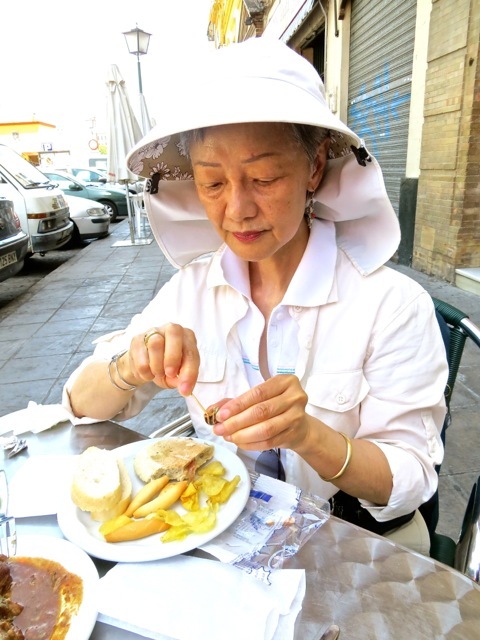 Then we ordered anchovies in baguette, fried cuttlefish and grilled shrimp. They were all very fresh and excellent. 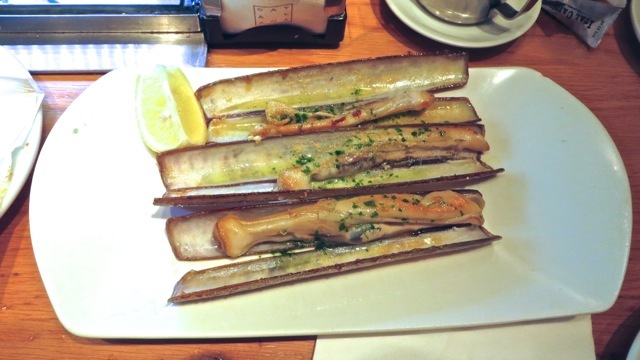 The grilled razor clams were fresh, tender and nicely flavored. They were prepared skillfully without overcooking which would make them tough. The final piece was a liquor-soaked cake. As I am allergic to alcohol, I could only taste a little piece of this delicious dessert. The bill for the whole tapas feast was surprisingly moderate. This excellent meal concluded our tapas adventure on a high note. The second New York Times article laments an alarming trend among restaurant in France. More and more French restaurants are reheating and serving industrial-cooked and frozen dishes. The French restaurant sector worry this would ruin its famous cuisine. 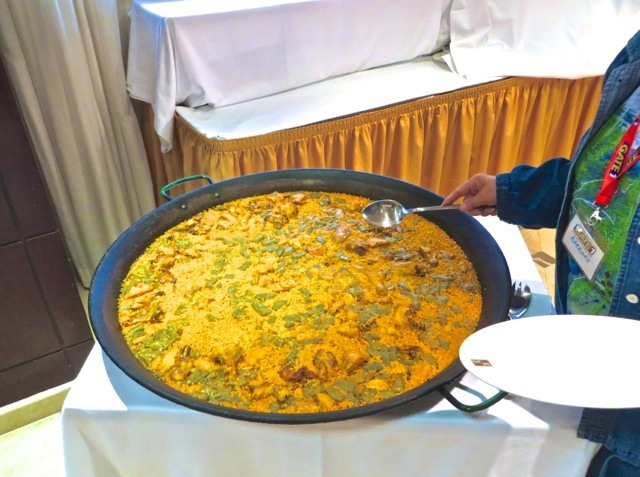 When we were in Spain, we tried the paella a few times. We expected to eat excellent paella which is reputed to be the Spanish national dish. We were badly disappointed for they were invariably undercooked. Having eaten rice all my life, I know when rice is undercooked and thus inedible. We could not believe the Spanish diners would tolerate the crunch of uncooked rice, or the chefs’ insensitivity to bad cooking. When we were in Provence, France, we ate in a French restaurant. I ordered paella as a last effort to find good paella. To our pleasant surprise, the rice was fully cooked, nicely flavored, and skillfully prepared. Cooking paella properly takes 30 minutes, and I believe the Spanish restaurants did not spend the necessary time to cook theirs right. As the Provence paella was served to me within 10 minutes, I believe it was industrially prepared and reheated by the restaurant. But if it takes industrial cooking for a proper prepared paella, then I would prefer the industrial cooking to in situ cooking. Posted by Robert Wu on Saturday, February 8, 2014, at 1:50 am. Filed under Uncategorized. Follow any responses to this post with its comments RSS feed. You can post a comment or trackback from your blog.